One of the daunting things about starting a business are all the unanswered questions: should you be a sole trader or a company? How does GST work, and do I have to register for it? And many more…but there is now at least a little help in the form of the Business Registration Service, a new government initiative to streamline the process of starting a business. But is it all that you need, and would you still need to come and see an accountant? Accountants Daily interviewed us to find out. Starting a business is one of the biggest steps you’ll ever make. It’s also one that can be the most rewarding, but at the beginning it certainly does seem very daunting, and the process to open a company and get started is unhelpfully a little convoluted. First you’ll have to register a company, and the easiest way to do that is to use the many online services that are available (we like Company 123). It’s not exactly rocket science, but you might need a shoulder to lean on when you’re filling out the various online forms. 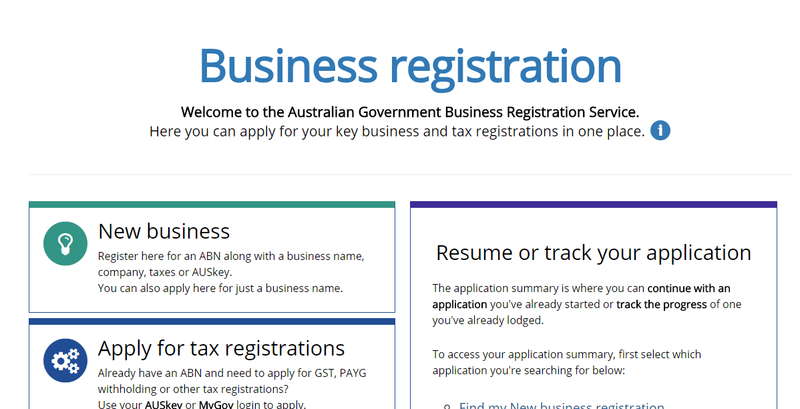 After that, you’ll have to head over to the Australian Business Register to get an ABN and a tax file number for your business, but it’s not exactly the most user friendly website out there, and there is a bit of a knack to it, like warning boxes that pop up, which you’re actually supposed to ignore. So the fact that the government has harmonised all of these services into one website, that promises a 15 minute turnaround…is GREAT. But when you’re starting a business, it’s really not only the formalities of starting a company that are important, but also all the other burning questions that you have. Do you have to register for income tax withholding? What am I supposed to do about superannuation? Should I register for GST or be GST-free at the beginning? How does GST work anyway, and is there something special that I need to do with invoices? So when you go to an accountant to help you set up your business, you also get the chance to ask for their advice on how to do things, and maybe build a relationship that will help you run your business. And for all of you out there who like to do it all yourselves (and all power to you, by the way) the new Business Registration Service makes it that little bit easier. But if you get stuck, your friendly neighborhood accountant would be more than happy to help.